When I think of a Valentine's Day makeup, I think of a minimal, feminine look that enhances natural beauty. No matter how you wear your makeup this Valentine's Day, good skin prep is a must. My latest obsession is face masks. Luckily there are three new masks from Miss Spa now available at Target. They include: 24K Gold Radiance Mask, Charcoal Clarifying Mask + Oxygenating Bubble Mask. 24K Gold Radiance Mask | Who needs gold jewelry when you can pamper yourself with a 24K Gold mask? This mask helps hydrate, restore and brighten skin which is perfect in the midst of a cold winter. It feels really cooling and soothing on the skin and even has a gold powder immersed in the creme that saturates the mask. This formula helped quench my skin when I had a lot of dry patches that wouldn't go away even with gentle exfoliating. If you're dealing with particularly dry, dull skin this winter, definitely pick this one up! Charcoal Clarifying Mask | While I definitely suffer from dryer areas this time of year, my t-zone is primarily oily and overall, my skin is prone to breakouts. This clarifying mask has charcoal that helps clear pores and leave skin clean and detoxified. It also has aloe so it feels really comfortable and soothing on the skin. The mask itself is a very flexible fabric that easily hugged the curves of my face. It was definitely my favorite shape and style from this brand. Oxygenating Bubble Mask | Ok, this was the most "fun" mask of the three for sure! When you unwrap this sheet mask, it appears to be a bit soapy. As it sits on the skin, get ready because it starts to bubble, crackle and make all sorts of noises as the bubbles go to work! You could literally scoop off bubbles as if you were in a bubble bath. The formula helps to refine skin with pineapple and white tea. It felt a little tingly, but that's how you can tell it's working! I just wish this and the 24K Gold mask were the same fabric as the Charcoal mask. I didn't find the white masks to fit as easily around my eyes and nose so they didn't lay perfectly. Other than that, the formulas were fantastic and the price is great. These facial masks are a great way to get pampered at home in only 20 minutes! Whether you're getting ready for a night out or having a girls' night in, it's always nice to have sheet masks on hand. 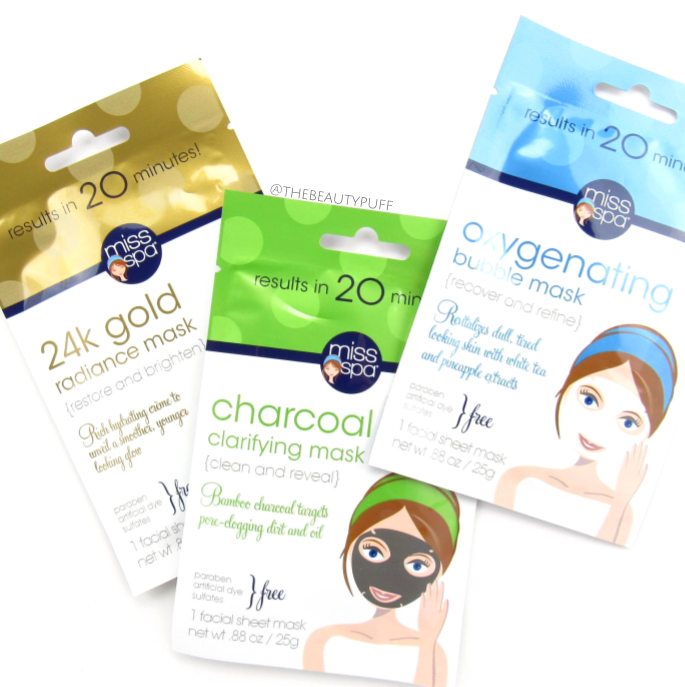 These masks are also free of parabens, sulfates, and artificial dyes. You can find these new Miss Spa Sheet Masks now at Target or on Target.com below.